Mary Lynn Hackworth, 83, passed away November 13th, 2017. She was born November 20th, 1933 in Newark, Arkansas. She was of the Methodist faith and a member of Hazel Edwards United Methodist Church of Newark for 67 years. She taught Sunday School for several years, sang in the choir, served in several positions for the Council on Ministries, she was a Communion Stewart, served on the PPR committee, and a member of the UMW. She also enjoyed crafts, gardening, camping with the family, and enjoyed the kids. She was preceded in death by her parents, Charles Leonard Cantrell and Mary Frances (Greenfield) Cantrell; one son, Mitchell Kelly Hackworth; six brothers, Lamen Cantrell, Woodrow Cantrell, Bill Cantrell, Hansel Cantrell, Vernon Cantrell, and Ray Cantrell; and three sisters, Pearl Baker, Bertha Gipson, and Editha Fields. 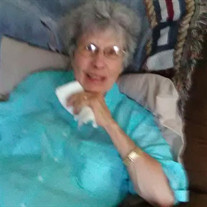 She is survived by her husband, Kenneth Hackworth of 67 years; two sons, Terry Hackworth and his wife Connie, and Ronald Hackworth and his wife Nettie; two grandsons, Brandon Hackworth and his wife Donna and Cody Hackworth and his wife Linda; four granddaughters, Ronda Piker and her husband Dane, Tracy Hackworth, Tara Sneed and her husband, Thomas; and Mary Sheree Hackworth; ten great grandchildren, Colten Chadwick, Cady Hackworth, Lindsay Hackworth, Emily Hackworth, Macie Hackworth, Joshua Hackworth, Jeffrey Hackworth, Lilliana Piker, Arianna Sneed, and Logan Shell; and a host of nieces, nephews, cousins, extended relatives and friends. Visitation will be Tuesday, November 14th from 1-2 PM with the funeral service beginning at 2 PM both at the Willis Funeral Service Chapel with Chaplain Doc Spurlin officiating. Burial will follow at Blue Springs Cemetery of Newark. Pallbearers include, Cody Hackworth, Brandon Hackworth, Joshua Hackworth, Danny Cantrell, Colten Chadwick, and Hunter Bear. Honorary Pallbearers include, Jeffrey Hackworth, Thomas Sneed, Dane Piker, and Logan Shell.